In the 30 years since David Packard initially created MBARI in 1987, the institute has grown from a handful of adventurous scientists and engineers to a globally respected research organization at the forefront of ocean science and technology. A recent issue of Oceanography magazine includes ten articles that highlight a few of MBARI’s accomplishments, as well as ongoing research and development. The result is an in-depth look at the institute’s continuing alliance between visionary scientists, talented engineers, and dedicated marine-operations staff. 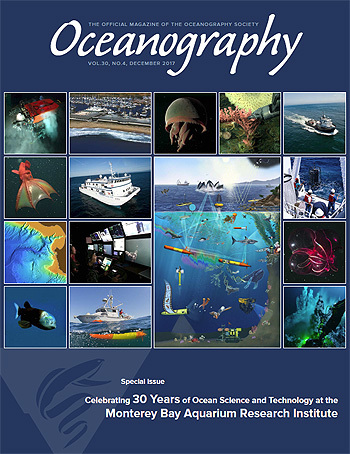 The special edition was edited by MBARI Senior Scientist Francisco Chavez, Senior Adjunct (and former MBARI Director) Peter Brewer, and MBARI President and CEO Chris Scholin. It includes detailed articles on many aspects of MBARI’s research, including marine biology, ocean chemistry, and seafloor geology. In many articles, dramatic scientific discoveries are linked to advances in ocean technology, such as cutting-edge underwater robots, automated sensors, and data-management systems designed by MBARI engineers. Articles by marine biologists Bruce Robison and Steve Haddock describe how MBARI research on deep-sea animals was facilitated by the institute’s pioneering use and development of remotely operated vehicles (ROVs) for scientific use. Haddock also calls out the institution’s Video Annotation and Reference System, which has allowed scientists to analyze data from millions of ROV video observations, and has resulted in dozens of groundbreaking scientific papers. Similarly, biologist Ken Smith summarizes his long-term studies of deep seafloor animals on the abyssal plain off of Central California using camera systems, sediment traps, and MBARI’s Benthic Rover. Marine biologist Jim Barry and marine chemist Peter Brewer describe MBARI’s use of ROVs and automated laboratory systems to perform quantitative experiments on greenhouse gases in the ocean. Brewer’s experiments on methane and carbon dioxide and methane showed how these gases interact with seawater, while Barry’s work shows how the resulting increase in acidity, combined with increasing water temperatures and declining oxygen concentrations, can affect marine animals. As an example of geology research being conducted at MBARI, volcanologist David Clague writes about his use of underwater robots to explore, map, and document the eruption history of a huge underwater volcano off the coast of Oregon. Other articles by Carol Sakamoto and Chris Scholin focus on the development and scientific benefits of MBARI automated sensors, such as the In Situ Ultraviolet Spectrometer and the Environmental Sample Processor. Both of these instruments were developed through years of effort by MBARI scientists and engineers, and were subsequently commercialized for use by businesses and researchers around the country. The issue ends with Chavez’ description of MBARI’s long-term ocean-monitoring efforts in Monterey Bay and how they have provided insight into short- and long-term changes in ocean conditions, not just locally, but across the entire Pacific Ocean. Chavez also explains how future monitoring efforts will increasingly rely on robots and other automated systems. The resulting data will help researchers understand not just changing in physical sea conditions, but also changes in the sea life and the health of the world ocean.